In the early-to-mid 1990s there was (rather inexplicably) a troll doll craze, which of course brought about a huge amount of new troll-related merchandise. Included in this was an attempt to market trolls to boys, via an action series called Stone Protectors. 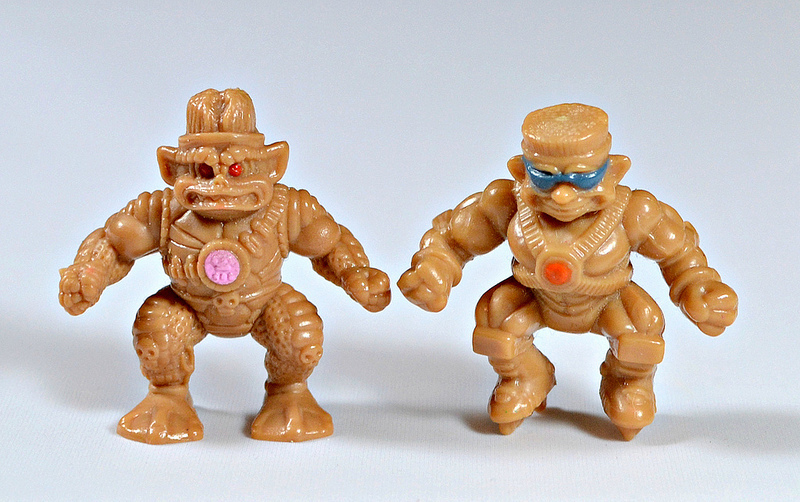 You're probably most likely to remember Stone Protectors from its cartoon, video game, or articulated action figures, but there was also an obscure set of mini figures released. The minis were offered as kids meal premiums at fast food chain Long John Silvers. They're made of a MUSCLE-like plastic in a MUSCLE-like flesh color, with minimal painted details. I got the two pictured above as a kid and have always been partial to the guy on the left, who has a cool reptile/amphibian look about him. I'm not sure how many were in the set, but the most I've ever seen together in one photo (below) is seven. This is not my photo--I grabbed it from somewhere a while back and can't remember where (if whoever took it reads this, please let me know so I can credit you). Can anyone confirm whether or not this is the entire set? Some of these guys are a bit goofy-looking, but then again they are based on troll dolls so I guess that's to be expected. All in all they're pretty interesting minis, and their obscurity makes them even more appealing. What do you think? 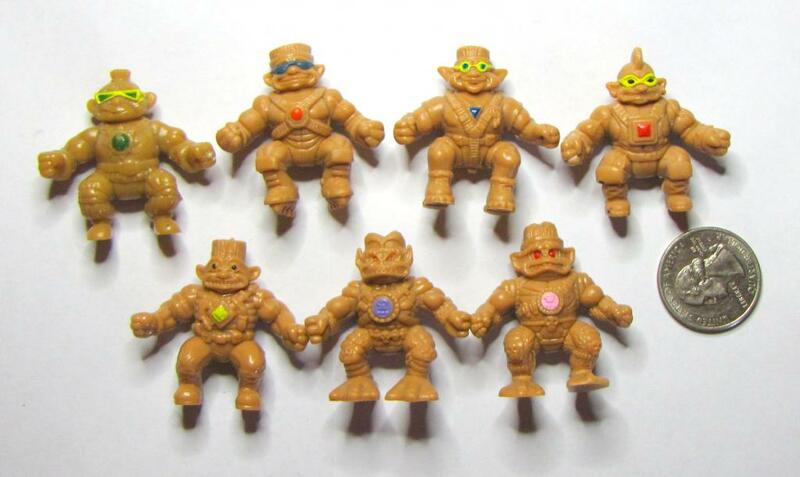 Do you remember these Stone Protectors minis or own any? Never knew they did mini figs of these guys...just crazy. yep just the 7 of 'em. top row - Cornelius the samurai, Maxwell the accelerator, Clifford the rock climber, Chester the wrestler. bottom row - Angus the soldier, Zak the evil leader, Zink the horrible hatchetman. Greetings for your blog! I am collector too,an last time it become some way of encyclopedia for me:) Great collection you have! But on the topic: I have a few of these dudes,but mine are with painted hairs,gloves and boots-and also are white,glowing in the dark. In fact I looking to trade them,I am not fan of any troll stuff (always remind me for the girl's hysteria for the trolls around me,omg! :D ). Sorry for the long post-but I hope,I was useful to you,if you dont know for the glow-in-the-dark version. That is very interesting--I've never seen versions that look like that. I'd love to see photos if you are able to take any.